Tuesday April 15th 1924 I was not away from the place. I do not cough quite so much. Lydia on the porch all afternoon. I slept some and talked with the folks. Wednesday April 16th 1924 It was a warm tiresome day. I helped a little with the work. Read a little. Slept in afternoon. Thursday April 17th 1924 It turned cooler last night. I packed my trunk in forenoon. Laura came from school in time to go the station with me. Edith stopped there. Went to the Jefferson Hotel in Peoria. Read in evening. Wrote some and to bed early. 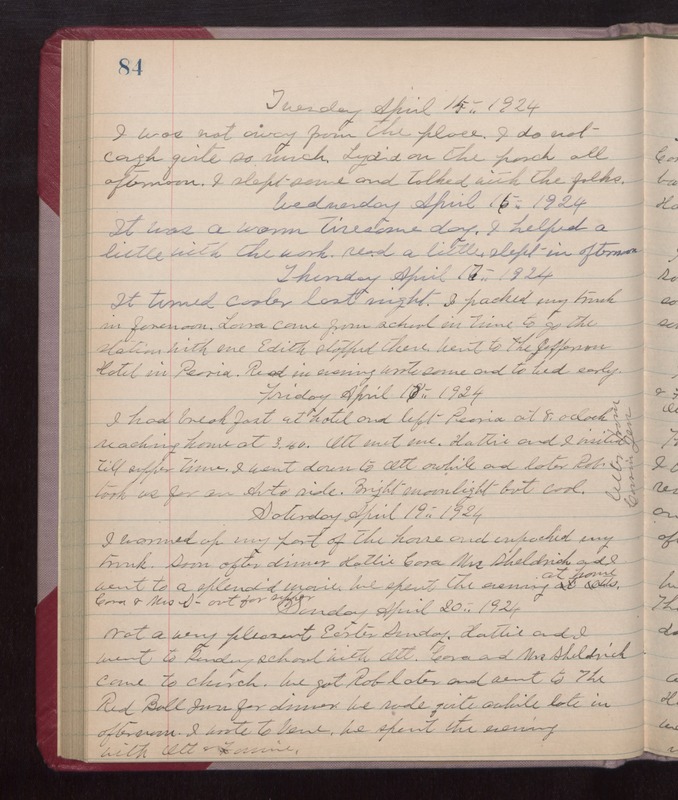 Friday April 18th 1924 I had breakfast at hotel and left Peoria at 8 oclock reaching home at 3.40. Ott met me. Hattie and I visited till supper time. I went down to Ott awhile and later Rob took us for a Auto ride. Bright moonlight but cool. Letter from Cousin Jen. Saturday April 19th 1924 I warmed up my part of the house and unpacked my trunk. Soon after dinner Hattie, Cora, Mrs Sheldrick, and I went to a splendid movie. We spent the evening at home. Cora & Mrs S--- out for supper. Sunday April 20th 1924 Not a very pleasant Easter Sunday. Hattie and I went to Sunday School with Ott. Cora and Mrs Sheldrick came to church. We got Rob later and went to The Red Ball Inn for dinner. We rode quite awhile late in afternoon. I wrote to Vene. We spent the evening with Ott and Fannie.